The Fountain Valley trail in Colorado’s Roxborough State Park is the Garden of the God’s of Denver. It’s more secluded than Red Rocks park, and features several trails that take you beyond the park boundaries and into the foothills. The Fountain Valley Trail is a perfect place to start because it features the best part of the park, it’s towering slabs of red rock. Explore the hiking profile below for all the trail details, trail map link, and driving directions to the trailhead for this easy Colorado hike. 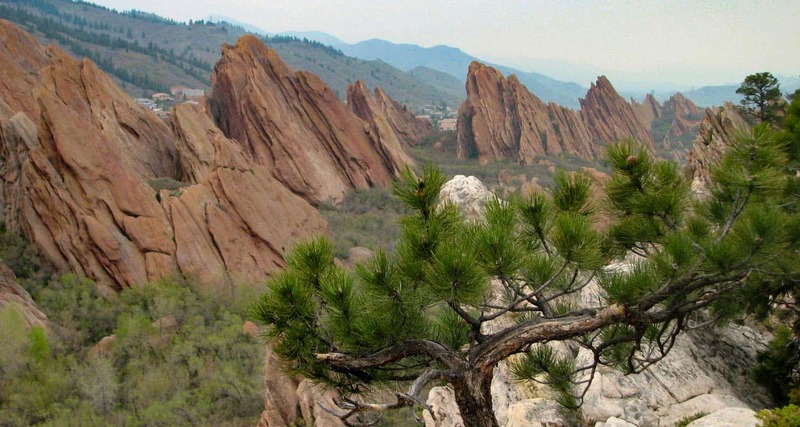 Roxborough State Park is Denver’s twin sister of Garden of the God’s in Colorado Springs. The beautiful Lyons and Fountain formations climb from the valley floor and create a wonderful space for a quiet hike, birdwatching, and viewing wildlife. TIP: There is a picnic area with tables just outside the Visitors’ Center. You can visit in the winter also. Yes! The snow on the red rock makes for some incredible natural contrasts, and parts of the park are shielded from the wind. Makes for great winter hikes. Great hike on a cool morning. 1-2in on the ground and it was beautiful. Definitely worth the $7. Are any special types of shoes required with the current weather? Would hiking boots suffice or snow shoes? Mike, at the time of me writing this, we have about 2 inches of snow on the ground, so I would think that hiking boots would be sufficient. Is it friendly for a young family? We have a 1 year old and 4 year old. We are visiting in February 2017. Yes! Roxborough is a great place for family hikes. I’d recommend the Fountain Valley trail.